ASTM F289 - 96(2014) Standard Specification for Molybdenum Wire and Rod for Electronic Applications this specification deals with molybdenum wire and rod for electronic applications. The following grades of molybdenum wire and rod are covered in this specification: Grade 1—commercially pure molybdenum wire suitable for leads, hooks, supports, heaters, and metal-to-glass seals; Grade 2—commercially pure molybdenum wire suitable for mandrel either black or cleaned; and Grade 3—commercially pure molybdenum rod suitable for leads, hooks, supports, and metal-to-glass seals. Materials shall be tested and the individual grades shall conform to specified values of chemical composition, minimum tensile strength, elongation, ductility, surface finish, dimensional tolerances, and straightness. ASTM B387 – 10 Standard Specification for Molybdenum and Molybdenum Alloy Bar, Rod, and Wire this specification covers unalloyed molybdenum and molybdenum alloy bar, rod, and wire. The following materials are covered: molybdenum 360, molybdenum 361, molybdenum 363, molybdenum 364, molybdenum 365, and molybdenum 366. These materials shall be manufactured with conventional extrusion, forging, swaging, rolling, and drawing equipment. These shall materials be made by vacuum arc-melted or powder metallurgy methods. The chemical composition shall conform to the required contents of carbon, oxygen, nitrogen, iron, nickel, silicon, titanium, tungsten, zirconium, and molybdenum. Chemical analysis shall be done. Mechanical properties shall conform to the required tension properties: tensile strength, yield strength, elongation, and diamond pyramid hardness. Tension test shall also be done. ASTM B386 - 03(2011) Standard Specification for Molybdenum and Molybdenum Alloy Plate, Sheet, Strip, and Foil this specification covers unalloyed molybdenum and molybdenum alloy plate, sheet, strip, and foil as follows: Molybdenum 360; Molybdenum 361; Molybdenum Alloy 363; Molybdenum Alloy 364; Molybdenum 365; and Molybdenum Alloy 366. The various molybdenum mill products covered by this specification shall be formed with the conventional extrusion, forging, or rolling equipment normally found in primary ferrous and nonferrous plants. The ingot metal for Molybdenum 360 and 365 and Molybdenum Alloys 363 and 366 is vacuum arc-melted in furnaces of a type suitable for reactive, refractory metals. For Molybdenum 361 and Molybdenum Alloy 364, the metal is consolidated by powder metallurgy methods. 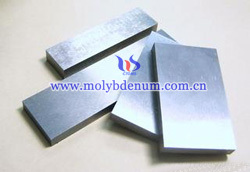 The molybdenum and molybdenum alloy ingots and billets for conversion to finished products covered by this specification shall conform to the chemical composition requirements for carbon, oxygen, nitrogen, iron, nickel, silicon, titanium, tungsten, zirconium, and molybdenum. The material shall conform to the mechanical property requirements for tensile strength, yield strength, elongation, and minimum bend radius.